Command Missile Operations badge, clutch back fitting, marked on the back L.I.G.I. The Missile Badge is issued in three degrees being basic, senior, and command (operations)/master (maintenance). The level of degree is determined by a service member’s years of missile duty in the Air Force and also the level of command responsibility held within the Air Force missile units. Any officer who is or has been combat mission ready (CMR), as a missile crewmember at an operational ICBM unit qualifies to wear the missile badge with operations designator—a wreath encircling the missile. The basic badge is awarded once the member graduates Initial Qualification Training at Vandenberg AFB. Officers with six years of nuclear experience qualify for the senior badge, and they qualify for the command badge after nine years experience. The Senior Missile Badge is denoted by a star above the decoration, with the Command Missile Badge displaying a star surrounded by a small wreath. Senior Missile Operations badge, clutch back fitting, marked on the back L.I.G.I. Basic Missile Operations badge, clutch back fitting, marked on the back L.I.G.I. 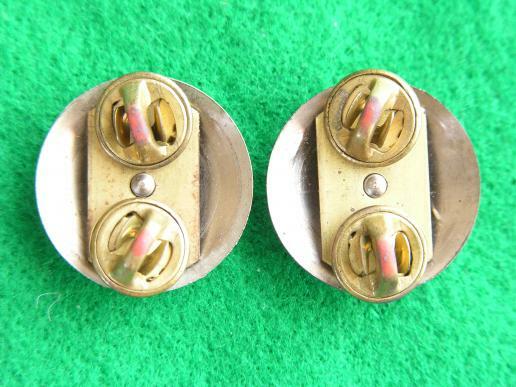 A pair of Officers Hospital Dietitian Corps branch of service insignia, Clutch back fittings. Quality strike. 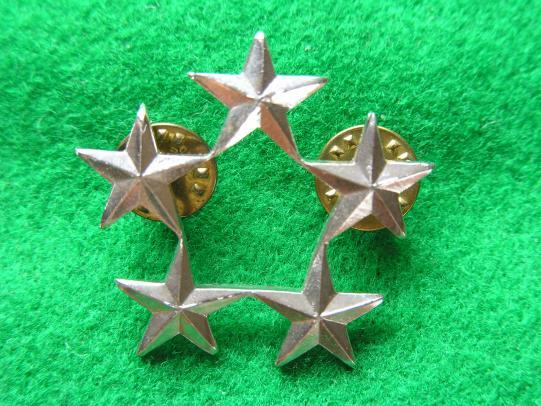 A pair of U.S.Army Officer Jewish Chaplain branch of service insignia. Clutch back fittings. Officer of Infantry branch of service insignia and U.S. letters in subdued finish with clutch back fittings. 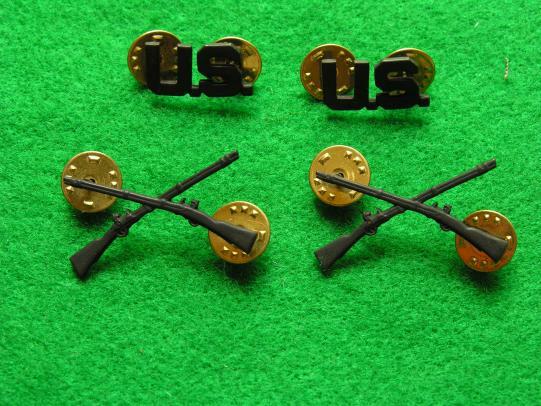 A pair of Officer's Cavalry branch of Service insignia crossed sabres in black subdued metal together with a pair of Officer's U.S. insignia all clutch back fittings. 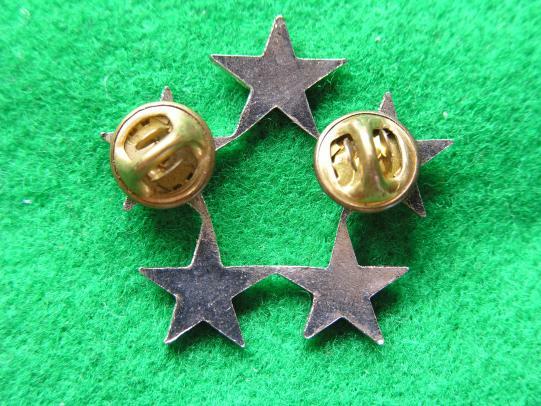 A pair of Nursing Officer branch of service insignia with clutch back fittings marked D22. Have several pairs in stock. 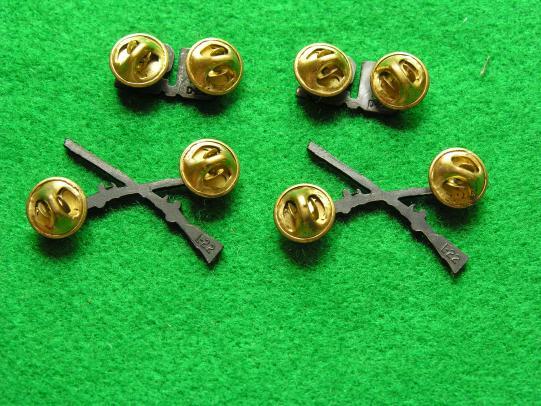 General of the Army/Air Force Rank, clutch back fitting. 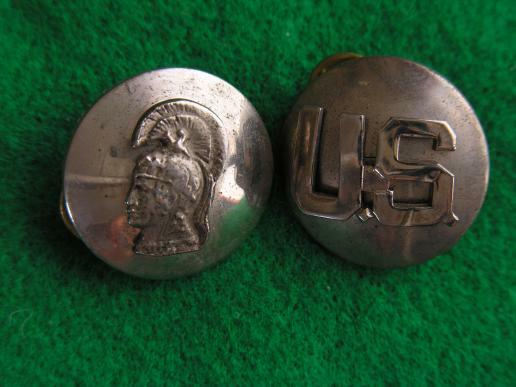 A pair of 1950's enlisted collar insignia woth clutch back fittings, some service wear please see images.